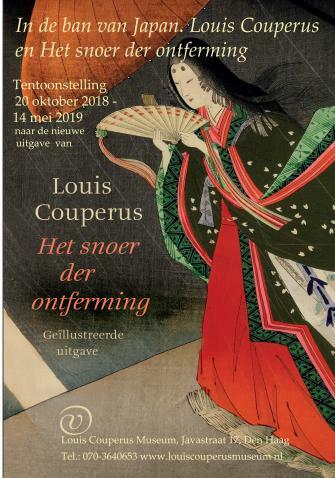 Couperus's two last books: Nippon (1924) and Het snoer de ontferming en Japansche legenden, 1925 (The Cord of Redemption and Japanese Legends) were the result of a trip, commissioned by a Dutch weekly, Haagsche Post, in 1921-1922, through the Dutch East Indies and Japan. The first book consists of a series of travelling letters, the latter is a literary elaboration of Couperus’s trip. Nippon has been translated into English (in 1926). A Japanese translation, by Yumiko Unimoro, is in the making. The current exhibition in the Louis Couperus Museum is inspired by the new edition of Het snoer der ontferming by dr H.T.M. van Vliet (see picture). It focusses on all the sources Couperus used: Japanese prints by famous artists such as Utamaro, Hirosighe, Motonobu and Hokusai as well as Japanese traveling guides, art books and reports by famous visitors to Japan such as Basil Chamberlain and Lafcadio Hearn. The exhibition is centred around four themes: nature, the Tokyo Yoshiwara, the power of fate and Japanese myths and legends. On show are the relevant Japanese prints in combination with Couperus’ text. The new edition of Het snoer der ontferming will be presented at the vernissage of the exhibition. The exhibition was made possible by Prins Bernhard Cultuurfonds.